Chemnitz - The Scientific Alliance of the University Professors of Plastics Technology (WAK) gives awards for the best scientific work in the area of plastics technology every year. 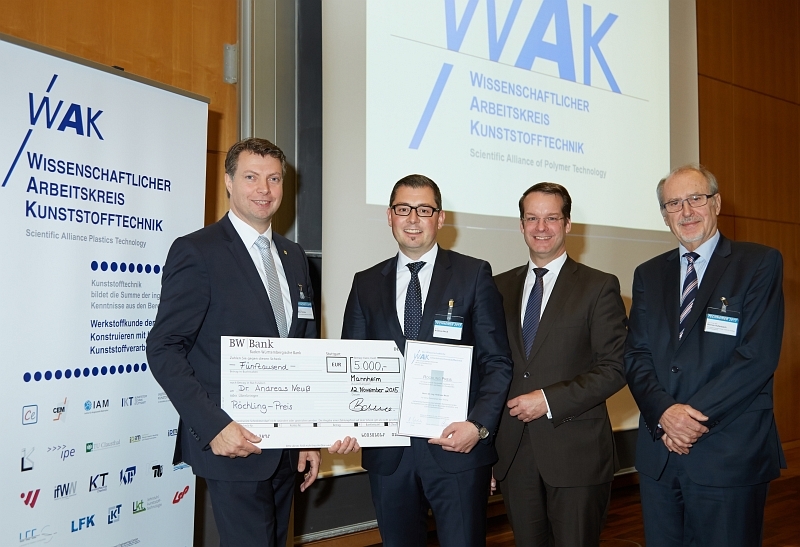 With the prizes, which were awarded on November 12th in Chemnitz, the WAK desires to both document important progress in plastics science and technology and motivate and support young engineers in their research. The prizes, which are endowed by innovative plastics technology companies, are oriented to the three key points in plastics technology research and education: materials, construction, and processing. This year, the Röchling Group numbered among the endowing companies for the first time. The “Röchling Special Prize for new hybrid materials, systems, and process techniques on the basis of plastics,” which will now be awarded annually, went to Dr.-Ing Andreas Neuß for his dissertation titled “Process Development of Hybrid Multi-Component Injection Molding for the Production of Components for Electronics and Electronics Applications.” Neuß completed his dissertation at the Institute of Plastics Processing at the RWTH Aachen University. In his congratulatory speech, Mario Frericks, General Manager Sales & Marketing at Röchling Engineering Plastics, emphasized the significance of hybrid materials. Classic materials can no longer fulfill the technical and economical demands in many areas. Just like the motto “the whole is more than the sum of its parts,” combining different materials expands the properties of the whole spectrum. Aside for the Röchling Special Prize, other companies awarded prizes for the development and description of engineering plastics for innovative applications, for methods and approaches for the development and construction of plastic components, and for new plastic processing methods and techniques. The best undergraduate thesis and masterʼs thesis are both awarded a prize of EUR 3,500 and the best doctoral dissertation a prize of EUR 5,000. The WAK strives to promote research and technology in plastics. The alliance promotes the exchange of experiences between people, institutions, and research associations that are active in the field of plastics technology. It coordinates university research interests; forms and maintains contacts to research institutions, associations, and promoting institutions; cultivates contacts with industry companies and associations; and performs public relations work for the interests of plastics technology.